Jade Sylvan has been published in PANK, Bayou, Basalt, BuzzFeed, The Sun, Word Riot, and others. Jade was the winner of the 2011 Bayou Editor’s Poetry Prize and was a finalist in the 2012 Basalt Bunchgrass Poetry Prize. Jade has published a book of poetry, The Spark Singer (Spuyten Duyvil Press, 2009), and a nonfiction novel, Kissing Oscar Wilde (Write Bloody Press, 2013). Jade has collaborated with some of the most groundbreaking artists in the Boston arts community in the role of creator, writer, and/or performer, in such wide-ranging genres as film (including co-writing and starring in the feature film, TEN), indie folk music, hip-hop, improv/sketch comedy, vaudeville, drag, visual art, playing anime theme songs on a harmonium, legitimate theatre, and rock & roll. Jade is originally from the Midwest, but now lives in Cambridge, Massachusetts among a rotating cast of geniuses, fairies, magicians, and kings. 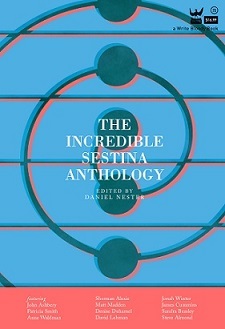 We went Behind the Sestina to talk to Sylvan about her “Facebook Sestina,” featured in The Incredible Sestina Anthology. Repetition, meter, and form in poetry has always been soothing to me. I specifically love the way re-contextualizing the same words can completely change their meaning, and how sometimes that changed meaning can make you go back and look at the word as it appears earlier in the poem differently. Even in my free verse and prose, I tend to repeat words, images and themes throughout in different contexts. Once a writer friend described one of my prose poems as an “exploded sestina.”I liked that. I write a lot of exploded sestinas. Can you walk us through the composition of “Facebook Sestina”? Is it inspired by real life events, place, narrative? I like the idea of a campfire as a metaphor for the popular social networking site? Am I barking up the right tree there? I was at a human evolution exhibit in the Natural History Museum in DC a couple years ago, and they had one of those “Evolution of Humans” timelines. You know the type: long line with little illustrations of Cro-Magnons with evolutionary turning-points marked at things like “Developing Language” and “Burying the Dead.” This one had marked “Gathering at the Hearth,” as one of these turning-points. I’ve always been interested in evolution, and I’ve seen a ton of these timelines, but I’d never seen “Gathering at the Hearth” listed alongside “Fashioning Tools” as a major event in human evolution. I realized that this was the earliest form of networking, and that the reason the scientists suddenly considered networking to be an intrinsic part of being human was probably things like Facebook. The sestina form fit perfectly. I decided to use half Facebook words (“like,” “friends,” “share”) and half half-Facebook words (“light,” “alone,” “build”) as the repeated words. Then it was just a puzzle. Since I refuse to dedicate anything to Mark Zuckerberg, I guess I’ll dedicate this to the Borg Queen. Resistence is futile. This entry was posted in Behind the Sestina and tagged art, Behind the Sestina, facebook, facebook sestina, form, jade sylvan, mark zuckerberg, Poetry, Sestina, social media, The Incredible Sestina Anthology. Bookmark the permalink.